A rousing game of “Will it Float?” occasionally played on The Late Show with David Letterman was really just an impressively popular density guessing game. 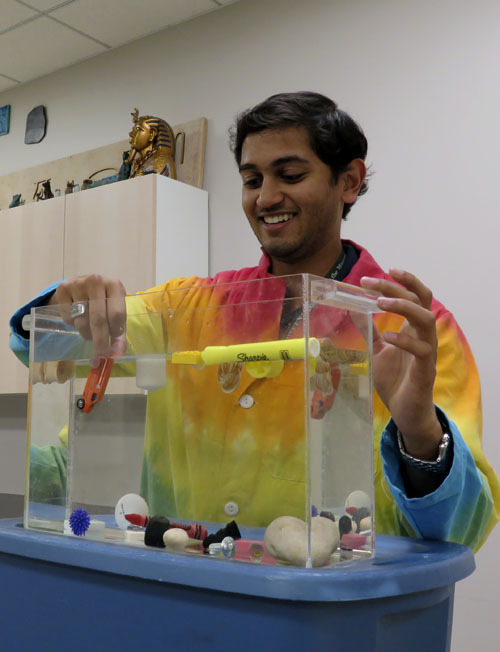 In our recently added Science Start Outreach Program, Discovering Density, we play a similar game, predicting and testing to see what happens when you toss things into a tank of water. The Science Start program is for grades K-2 and travels to schools, daycares, scout groups, and more to educate students with hands-on learning experiences. Sahil tests the hypothesis that a tiny metal car is denser than water and will sink. The most fun results are the ones that surprise the young students, like a whiffle ball that will not sink even though it is full of holes, a Lego brick (you’ll have to test that one out for yourself), or liquids that can float on or sink through other liquids in a density column. 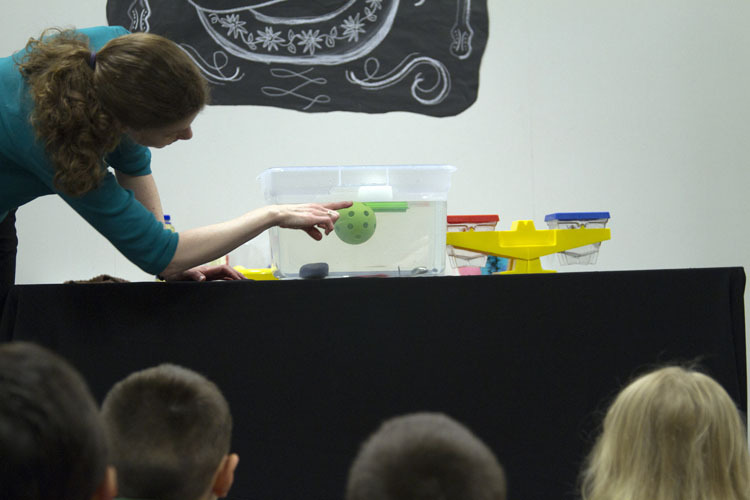 Carolyn points out to a class at Passmore Elementary that an object that is floating must be touching the surface of the water in a presentation of the new Discovering Density program. Making the distinction that density isn’t just about weight or mass or size but instead the comparison between the two can be a tricky concept at first. Similarly, very small and very large numbers, distances, and time scales can be difficult to grasp, so to make it a little easier, you could try holding a planet like Jupiter or maybe Neptune, if you prefer, as we model the vast distances of our solar system and think about scale in Space: Going the Distance. Carolyn points out the different types of liquids forming four distinct layers in the density column that she made during the presentation. 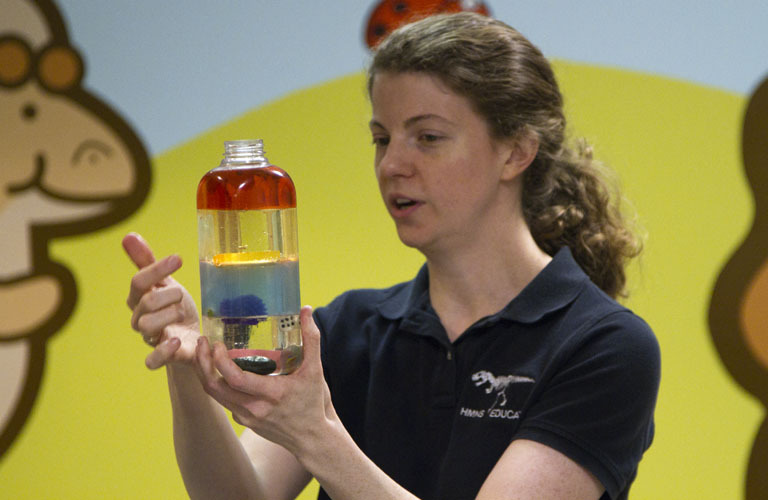 The density column was given to the group’s teacher after the show so that students could watch it change over time. Volunteers spread out with their planets to see the relative spaces between their orbits and explore what a model is, why it’s helpful, and what about the model isn’t quite as it is in real life. For our model to be to scale for both the sizes of the planets and for the distances between them is tricky—in a classroom-sized solar system, it’s going to be almost impossible to see most of the planets from most seats, and even the sun seems petite! 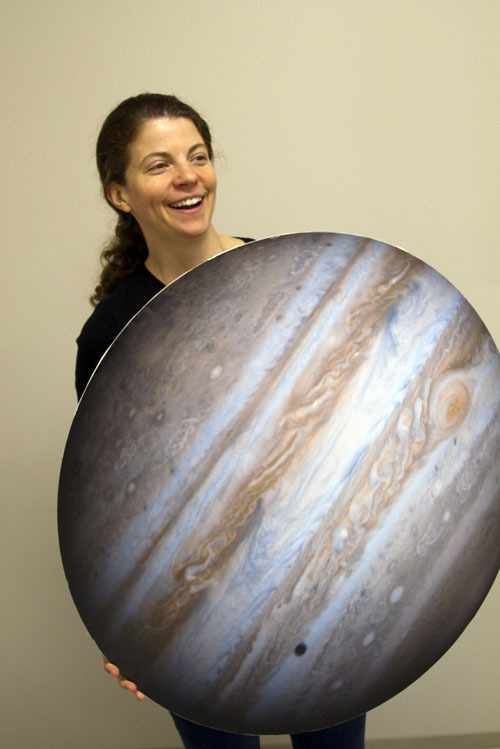 Carolyn holds up a three-foot board that models the planet Jupiter. If Jupiter was just three feet across, the Sun would have to have a diameter of 23 feet! Book Science Start for your school or scout group today by contacting Greta Brannan at (713) 639-4758 or outreach@hmns.org. For more information on HMNS outreach programs, click here.